Here are 10 quilts created between circa 1940 and 2001 by African-American women in Gee's Bend, AL. Located southwest of Selma, on a big bend in the meandering Alabama River, Gee's Bend -- officially named Boykin in 1940 -- is a community made up primarily of African Americans descended from slaves. The first slaves were brought to this pocket of bottomland in the early 1800s, when North Carolina planter Joseph Gee established a cotton plantation in the area. His relative, Mark H. Pettway, brought more slaves after indebted members of the Gee family deeded the estate to him in 1845. Today Pettway remains a common surname among the local families. For generations, geography has isolated "Benders," as the residents of Gee's Bend are also known. Water surrounds the community on three sides, and by land only one long strip of roadway (which was not paved until 1967) leads in from the northwest. The ferry that once connected Gee's Bend with Camden, AL, stopped running during the 1960s. Decades of separation have made it difficult for the residents of Gee's Bend to escape poverty, but isolation has also brought a priceless gift: the uninterrupted transmission of the quilting tradition. Created for the practical purpose of keeping warm, the quilts also demonstrate how greatly ingenuity and improvisation are prized in Gee's Bend. Having learned from their mothers, grandmothers, and other female relations the fundamental motifs and techniques for stitching pieces together, each quilter is then expected to find her own manner of expression. As a result, seemingly infinite variations have made the quilts sources of both pride and friendly competition. The quilts of Gee's Bend gained national attention in the late 1960s, when some of the women joined with quilters in nearby communities to establish the Freedom Quilting Bee in Camden, AL. Founded in 1966 with the help of Episcopal priest and Civil Rights activist Francis X. Walter, the quilting cooperative quickly brought recognition to Gee's Bend. Walter transported quilts to New York City, where they were sold at auction, and within two years the cooperative had contracts with leading decorators and large retail stores. 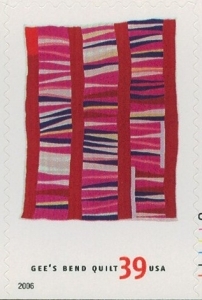 Many of the quilters from Gee's Bend felt constricted by the standardization of their improvisational techniques however, and soon left the Freedom Quilting Bee. Most preferred to give up the minimal monetary benefits the cooperative gave them rather than lose the unique aesthetic practices that the community had so long nurtured. Nevertheless, the women kept making quilts, and their quilting traditions remained vibrant in the local community.